Castiglione Della Pescaia, a dated town overlooking the sea placed between Punta Ala and Marina di Grosseto. The old part of the town is a balcony on the Tyrrhenian sea , It’s the home of a tourist port which offers daily excursions to the islands found in the Tuscan archipelago. Castiglione della Pescaia boasts ancient origins, the first traces of encampment in this area go back sixty thousand years, whilst the first urban settlements are found in Vetulonia, the ancient town that the Etruscans built near lake Prile (no longer in existence) The Romans instead, founded the village of Salebrone famous for its mild climate, the lake teeming with fish and the surrounding area full of wild game. 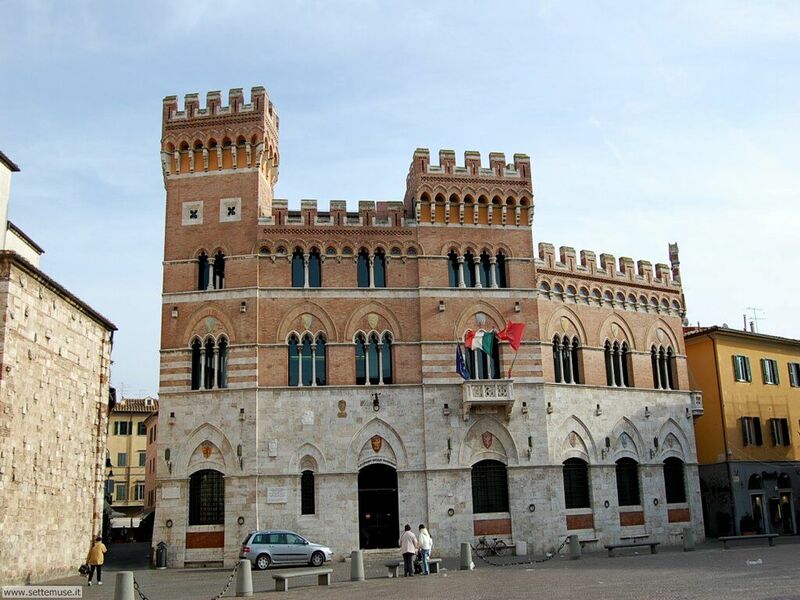 After the fall of the Roman Empire and the incursions of the Barbarians, in the year 962 Castiglione was given over to Pisa by Ottone the 1st of Sassonia, the emperor of Germania. Pisa exploited the resources without worrying about the sand filling the port and of the waters of the lake Prile that, becoming stagnant, caused the increase of malaria epidemics. 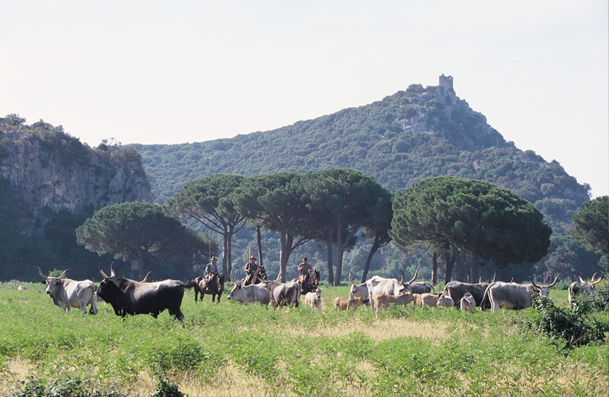 The Natural Regional Park of Maremma was instituted in 1975 but, not withstanding its reduced dimensions (app.10.000ha) and young age, in a short length of time has become a reference point for an ever increasing number of people. Park of Maremma. In 1993 it was honored in the Diploma of European Park released by the European committee. Visiting the park will certainly be a pleasurable and informative experience, however one must bear in mind that stopping at just one visit may, in some instances, result in ones expectancy being deluded, often over-dimensioned with respect to the actual possibility offered by the brief length of time available; One must remember it is not a zoo, the animals run freely and are not at our disposition. 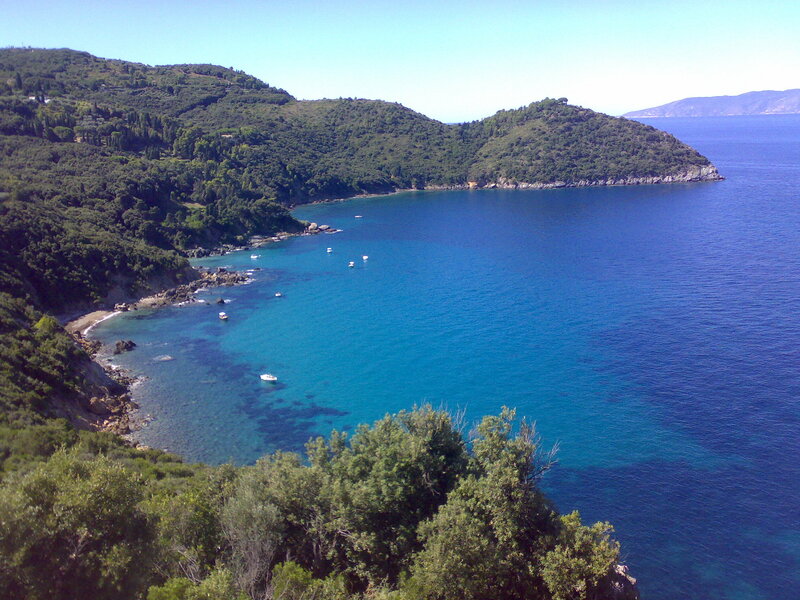 The visit to the park is possible only on foot; there are two access points for the itineraries; Alberese and Talamone. For the itineraries departing from Alberese, of which there is a brief description, the access is normally possible on Wednesdays, Saturdays, Sundays and holidays, however for further information on the times and visits it is advisable to contact the information office of the park. Vetulonia is an ancient Etruscan city that gave Rome the lictorial symbols of the fasces and the axe. Vetulonia Vetuloniareached its highest splendor between the 7th and 6th century A.C. and still preserves many memories of its ancient power. After the splendor of the Etruscan period, Vetulonia declined, and in 1181 due to the necessity to fortify for the defense of the inhabitants, the Castle of Colonna arose. Of the mposing Etruscan perimeter wall, there remain only a few sections, and in the immediate surroundings of the actual town one can find the Etruscan necropolis. Among the graves the can be visited, that are remarkable, the Diavolino grave and the Petrera grave, that can be reached entering the road that leads to Buriano. In the town one can visit, once the restoration work is finished, an archeological museum, due to open soon, with exhibits of remarkable value. Marvelous is the view that can be admired of the sloping gentle hills . Monte Argentario is a promontory, which plunges in the “Tirreno” sea in front of the two most southern Islands of the Tuscan archipelago: Isle of Giglio and Isle of Giannutri. 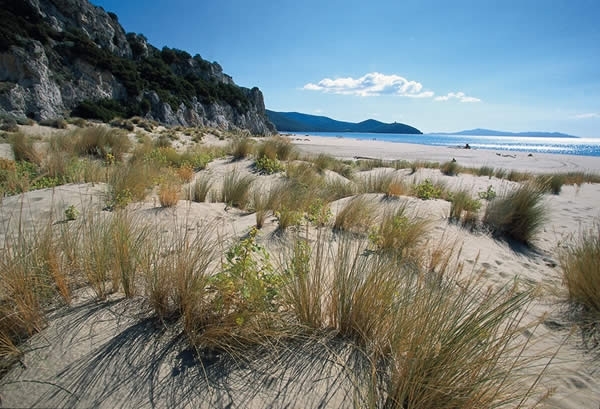 Argentario was born as an island, but during the centuries the combined action of sea-currents with the Albegna river has created two “Tomboli” ( sand-dunes): the Giannella Tombolo and the Feniglia Tombolo, which have joined the island to the mainland and so it created the “Lagoon of Orbetello”. The top of the Monte Argentario is “Punta Telegrafo” (635 mt), the promontory is characteristic of a complete mountains territory which has been rounded off, during the years, by the man’s work, so that they created special terraces where vineyards are cultivated. The coast is very scraggly, and offers several stony inlets of remarkable naturalistic beauty. In this environment, the two seafaring villages raise, and together represent the council of Monte Argentario. Porto Santo Stefano on the east side, the municipal building seats, and Porto Ercole, smallest than the other one, on the south. A fortified city along the road between Rome and Pisa, in 1138 became the bishop’s residence gaining importance in Maremma. Later taken over by the “Aldobrandeschi” then conquered by the “Senesi” and in 1559 taken over by the “Medici”. There followed various reclamations for at least two centuries. The Saturnia Thermal waters are famous in the world because of its prodigious thermal spring. It’s concerned with sulfurous – carbonic – sulfate – bicarbonate – alkaline – earthy, which spouts from the subsoil to 800 lt. per seconds, the unchanging temperature is 37°. Thanks to its special composition, and its natural temperature, the Saturnia water has healthy and stimulating properties, efficient for skin, respiratory device and bones. One can plunge himself into the famous Molino waterfalls, those are located in the atmosphere of the Maremma countryside, few kilometers far from the center of Saturnia. There, the entrance is free, and during the wintertime that hot shiver is a healthy sin. That is suitable for all the people of any age. Suggestive atmosphere in the night: small waterfalls lit up by the moon light. The thermal water of the sulfate-spring spouts inside the establishment of “Terme di Saturnia”, where one can plunge himself in the natural pools or joins the hydro-massages. 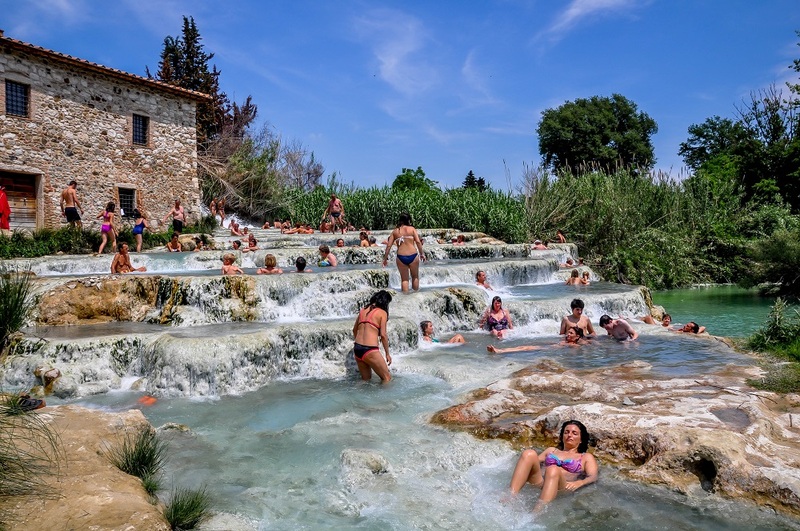 The Terme di Saturnia establishment offers several healthy services: besides the hydro-therapy and the classic thermal therapies such as: mud-wrapped, aerosol, etc…, it is also possible to join of esthetic treatments and holistic massages.